When people we care about face deep pain and suffering, we can often in turn experience a sense of helplessness. Questions such as, “What am I supposed to do?”, “How do I fix the situation?”, or “How do I keep this person safe?” are likely to enter our minds. I had the recent pleasure of sitting in on a meeting of Project LETS at RISD when the topic of not knowing how to offer real help entered the conversation. I also respond to these types of questions and concerns in my therapy practice; a client may end up feeling responsible for the welfare of a peer or loved one who is struggling. This can provoke mental health issues for the appointed caretaker as it can be scary and overwhelming and elicit a sense of helplessness that manifests as anxiety and depression. We often think to be a good friend means to offer really good advice and more: to fix the situation and take away the hurt. It’s painful to see someone we love hurt. Of course we’d want to take the pain away! Paradoxically, what our loved ones need is not to be fixed but rather to be free to safely express themselves in their vulnerability. Feeling unsafe to be vulnerable is often what keeps people from seeking proper help. We need to be seen and heard and offering a space for your loved ones to do that is is not only what they need most, but also simpler for you than attempting the impossible task of fixing it. Paradoxically, what our loved ones need is not to be fixed but rather to be free to safely express themselves in their vulnerability.”Another important thing about humans is that we don’t need advice. Although we often think we do and often think we should give it, really what we need, what our friends need, is support attending to their hurt and finding resolution. Remember, we are each and everyone of us unique, therefore what we need is unique too, and it’s important not to assume. 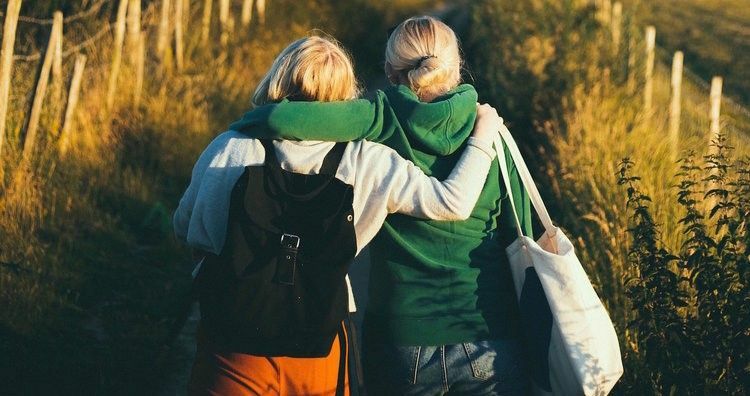 Here are some ways to support a friend in need in a safe and validating way, as well as how to assess risk. Use a validating statement, such as: “that sounds really scary” or “that sounds really painful.” To validate means to show that something is real (as they’re experiencing it) and acceptable. An example of invalidating: “Don’t be silly, you’re amazing.” This sounds like a compliment, but what your friend hears is that what they’re experiencing doesn’t matter because feeling this way is silly. Instead, try “I know what it’s like to feel (worthless) but I see you as (so strong and capable). Be careful not to go into your own story. Sometimes we do this to connect but often it leaves a person feeling unheard. If you felt it was helpful to your friend to know that they are not alone, share an example from your life, but keep it brief. Just enough to show them that “together we have a shared experience.” This can help to normalize their experience. Remember, somebody came to you because they trust you. You’ve shown them something positive about yourself along the way. Sometimes people just need to talk about their feelings and feelings are not to be mistaken with behaviors. “I am going to kill myself” is different from “I feel like killing myself.” Still, both are very scary to hear from a friend, or anybody for that matter. Let’s look at “I am going to kill myself.” This statement includes behavior. Remember — your friend is telling you! If a person didn’t want help they wouldn’t tell anyone. They would make it happen. Do your best to stay calm. The best way to stay calm is to keep breathing and to gently ask some questions, like “Do you have a plan?” or “Is there something bothering you that you’d like to talk about?”. To start, you are getting this person to talk. “I feel like I am going to kill myself” involves the same initial strategy; get your friend talking and gather some information. REMEMBER: You are not a trained professional nor are you expected to be! Now what kind of help? How do you know how to direct your friend? “I have a plan” = call 911 or campus safety and report a mental health emergency. They will send a trained paramedic. Ideally you do this with your friend if they are willing. If they are unwilling, you find a quiet place and send the paramedic to the location of the person. If you don’t know their exact location, call anyway. ALWAYS TRUST YOUR GUT and know what you can handle! It is always better to be safe than sorry. What happens in the aftermath of calling 911? First of all, know that your interest to help and your willingness to take time to educate yourself make you a good friend. Even if your friend can’t see this right now and is angry with you, you did the right thing. People have the right to feel angry, but they do not have the right to hurt. Sometimes we have to tolerate a friend’s anger. Make sure you have the support you need. Perhaps it would be helpful for you to be talking to a therapist to process this experience. Helpers need help, too. If your friend allows, follow up with them. Ask them how they are doing and if it’d be helpful for them to talk some more. Make sure they got connected to a mental health professional and they secured what they needed in place. The first try isn’t always successful. You can offer to support them in trying again, regardless of the scenario. As the old saying goes, “you can bring a horse to water, but you cannot make it drink!” If you need to call 911 or campus safety because a person is just that unsafe over and over again, then that is what you do.